It’s time to relax and unwind from the frantic pace of everyday life with our stress relieving coloring books for adults. Available in three themes: Oceans, Nature and Patterns. Adult Coloring Books are available individually or sold as a convenient relax pack which includes a Stress Relieving Coloring Book for Adults packaged with a set of 10 Colored Pencils in a clear, sealed poly bag. 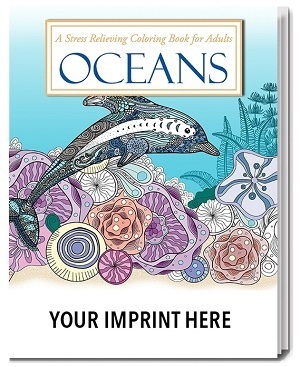 For an extra special give-away, consider a Gift Pack which includes all 3 Stress Relieving Coloring Books - Oceans, Nature and Patterns books included – along with a pack of 10 colored pencils! All packaged in a clear, sealed poly bag and no assembly required. 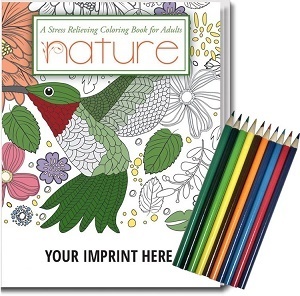 Your advertising information is custom printed on the front cover of these Adult Coloring Books which will leave a lasting impression of your business with anyone who receives one. Give us a Call or Text at 706-258-7041 to put our promotional and advertising experience to work for you. FREE quote provided. Put down the phone; turn off the computer. Enjoy coloring these 24 fabulously detailed pieces of art, printed on one side of a perforated white page – perfect for framing. Full size coloring books are 8" x 10.5", with a heavy duty cover. Custom imprint area is 7" x 1.75". It's a great escape! Calming and relaxing; get ready to color the stress of the day away. Perfect for corporate gifts, executive gifts, holidays, hospitals, senior centers, real estate, banks, finance, insurance and more! Ocean themed, relaxing Coloring Book for adults. Feel the ocean breeze and enjoy the beauty of the sea with a stress relieving coloring book for adults. These adult coloring books have beautiful art with ocean themed designs. 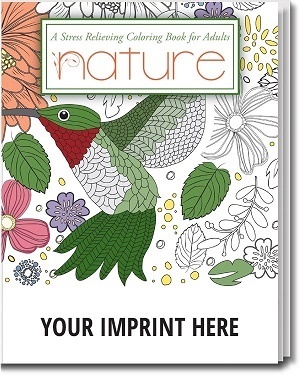 Nature Adult Coloring Books feature beautiful art with nature themed designs. 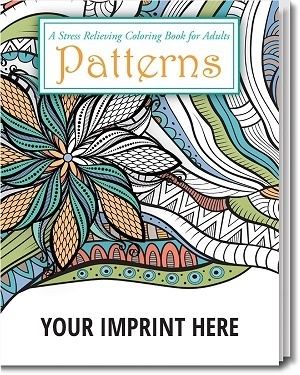 Patterns Adult Coloring Books feature intricate patterns of beautiful art. 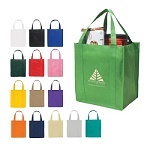 Price includes a 1-color imprint with one of our standard colors: Black, Blue PMS #286, Green PMS #355 or Red PMS #186. 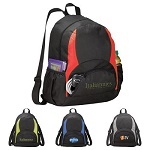 Contact us for additional charges for other imprint colors or full color imprint. 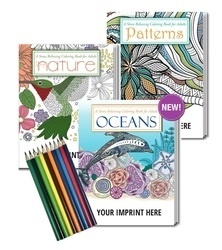 Gift Pack which includes all 3 Stress Relieving Coloring Books - Oceans, Nature and Patterns books included – along with a pack of 10 colored pencils! All packaged in a clear, sealed poly bag and no assembly required. Call or Text us at 706-258-7041 for pricing and a FREE quote.